Large apartment block "Sonnenhang", 1'230 m a.s.l.. 3 km from the centre of Mühlbach, in a quiet, sunny position on a slope. In the house: lift, storage room for skis, washing machine, tumble dryer (for shared use, extra). In Winter: please take snow chains. Parking at the house. 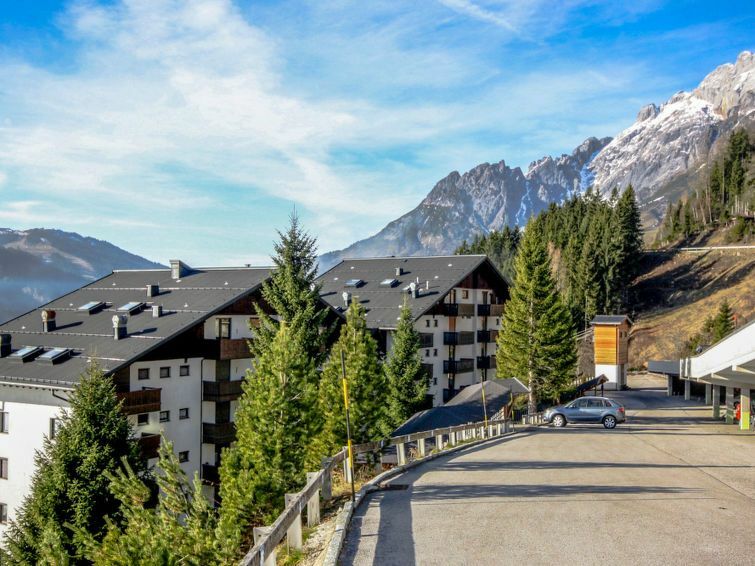 Shopping centre 5 km, restaurant 100 m, bakery 5 km, café 100 m. Walking paths from the house 10 m, ski lift 1.7 km, gondola lift 6 km, slopes 1.7 km, ski bus stop 50 m, ski school 6 km, children's ski school 6 km, sled run 6 km, cross country ski track 50 m. Well-known ski regions can easily be reached: Mühlbach-Dienten-Maria Alm 6 km, Hochkeil 2 km. Hiking paths: Hochkönig 20 m. Please note: ski bus (free of charge). There are more similar properties for rent in this same residence.
" Top C 34", 3-room apartment 65 m2 on 1st floor. Bright, modern and tasteful furnishings: entrance hall. Living room with dining table, cable TV and DVD. Exit to the balcony. 2 double bedrooms. Small kitchen (oven, dishwasher, 4 ceramic glass hob hotplates, electric coffee machine). Bath/WC. Balcony 10 m2. Balcony furniture. Beautiful panoramic view of the mountains and the countryside. Facilities: hair dryer. Internet (WiFi, free). Reserved parking space n 91. Please note: non-smokers only. The apartment is on the right side of the hallway. Wir haben den Aufenthalt sehr genossen! Die Wohnung ist toll ausgestattet und bietet einen tollen Blick ins Tal nach Mühlbach!